A Liebster award to be exact. And I was kindly nominated for it by Emily Lewis. My dear, we have the same surname! That makes me like you even more (and no she isn't my sister). So thank you very much to Emily Jayne Lewis at I Hate Ads. 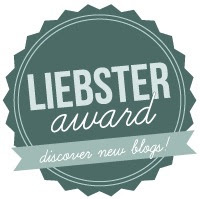 The Liebster Award is given to new bloggers with less than 200 followers and therefore helps promote and support those bloggers nominated. -Nominees must link back to the blogger who awarded them. -If nominated, write '11 Random Facts' about yourself. -Answer the 11 questions the person who nominated you wrote for you. -Come up with 11 new questions to be answered by 11 new nominees. 1. The first album I ever bought was Dangerous by Michael Jackson. 2. I love singing the ridiculous words to Chesney Hawk's "I am the One and Only". 3. I really love shows, films and books about witches and wizards. 4. Growing up I wanted to be Sarah from The Labyrinth SO MUCH! 5. When I was about 14 I got bullied so I made up an invisible dog friend called Seb to keep me company. He was a border collie. 6. If I won the lottery I'd become a painter. 7. When I was young I wanted to be a gipsy - I wanted to live in a caravan, sell lavender and travel around the country. When I realised this wasn't a career option I decided I wanted to be an actress. 8. I've played a stripy alien, Daisy Meredith from Daisy Pulls it off, an oompaloompa, a 19th century teacher, a fairy, a Hitler youth, a chavvy murderer, a santa, a bin man, a child who can't talk, a massacre victim, a ghost, a Welsh dragon and a prostitute on stage. 9. I really like those cheese and ham croissants from Pret. 10. If I had a last meal on death row I'd choose my Dad's meatball curry. 11. One of my favourite memories is dancing to T-rex with my family with my dad with a tea towel on his head strumming on a french loaf. 1. Who/what was your blogging inspiration? I started blogging because I wanted to work for a cool Advertising agency. At one such agency an interviewer asked me if I had a blog. I said no, I didn't get the job. My guilty pleasure is The Spice Girls. I love them. 3. What was your fashion fail of all time history? So many to choose from...probably a navy long legged playsuit. I looked AWFULLY lumpy. But I refused to throw it out because it was fashionable...must throw it out. 4. What's in your handbag/manbag? Purse, blistex, pressed powder, an instruction manual for my dishwasher, the guarantee for my boiler, beats by dre headphones, an umbrella, a plug, tissues, lipgloss, glasses, keys. iPod. Yes, I need to empty it. 5. What's the best advice you have ever been given? "No matter if you have a job lined up or not, set yourself a deadline and leave" - the career's advice lady at Oxford University when I was so unhappy in my job that I went back to university to talk to the careers service. 7. What one item from your wardrobe can you not live without? There's not one thing I can't live without but my favourite item is s pair of Furry tasselled snow boots. 8. Do you prefer designer or high street? High street. But was I rich it might be different. 9. If you were to model for a company/designer who would it be? Noone would have me. But if my body shape became miraculously fashionable I'd model for Alexander McQueen's brand. 10. Do you have any tips on hair/beauty/fashion that you could share? Ok - I have a stripe of purple hair on one side cut in about halfway so it's subtle. I've had a lot of compliments and it's quite unusual. 11. What fashion item do you despise? 1) If you could interview anyone in the world who'd it be? 2) If you won the lottery what would you do with your life? 3) What do you dream about in your sleep the most? 4) What are you scared of? 5) What is the song of your life? 6) What was your first ambition in life? 7) If you could snog one celeb, marry another and lock away another who would they be? 8) Which celebrity reality show would you go on if you were famous? 9) What do you eat for breakfast? 11) The worst advice you've ever been given was what? Hi Aimee, thanks so much for including my blog in your recommended list. I'm not surprised you got a blogging award as your blog is a very interesting and addictive read. I'll try and post on my blog answers to all the questions over the next week and I'm certainly to recommend you for a blogging award.